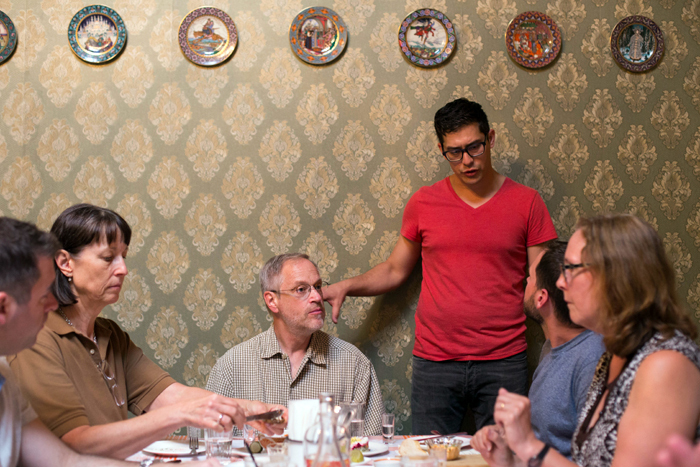 This episode of Portland Food Adventures brought us to the latest hot spot in Southeast Portland, Bonnie and Israel Morales’ new Russian restaurant, Kachka. After cocktails in the main dining hall we were brought into a private dining room, where there were tons of small plates (or Zakuski) laid out to try. This included several pickled items, king salmon roe, salo, cod liver pashtet, among other things. We were also given a few different house infused vodkas to try, one of the more interesting ones being a horseradish infusion. This PFA more than almost any other was very hands on with our lovely hosts. Israel was extremely forthcoming in keeping us informed about what we were eating, why it was relevant to their vision of the restaurant, and what else we could expect from our upcoming dishes. 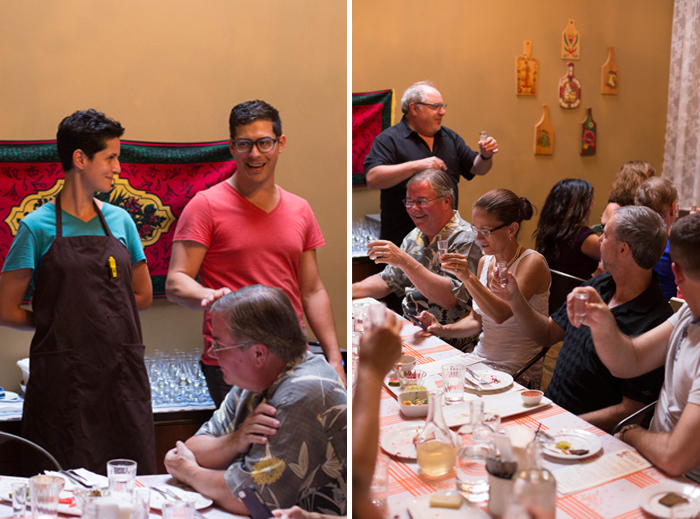 Bonnie and Israel introduced us to their restaurant and talked a bit about their history. The idea here is that Russian food gets easily pigeon holed into a certain flavor profile or seen as unappetizing from a Western standpoint, and they want to make food that is authentic but accessible. And of course in true Russian tradition, we all said a ‘cheers’ with our vodka shots for our great hosts! 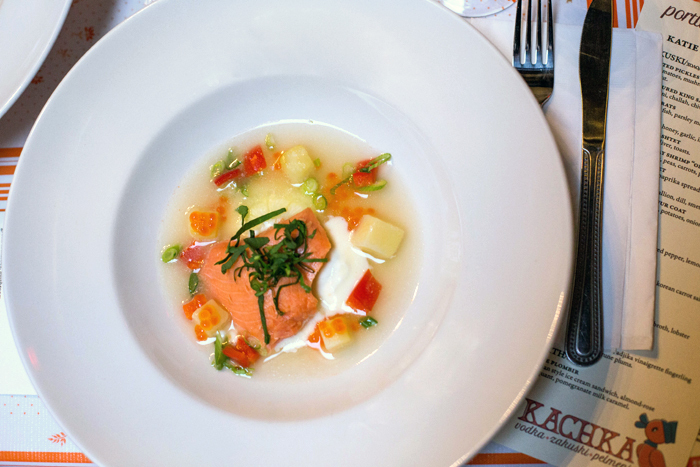 Our first main course was a “Salmon Ukha”, a king salmon soup with fresh broth poured on, served with yukons, red pepper, lemons and roe. Next up was the “Korushka”, a lightly fried copper river smelt with Korean carrot salad and parsley. This was paired with a Russian lager as a rather traditional meal. If this lager is any indication, they could take some lessons from the Portland micro brewers! 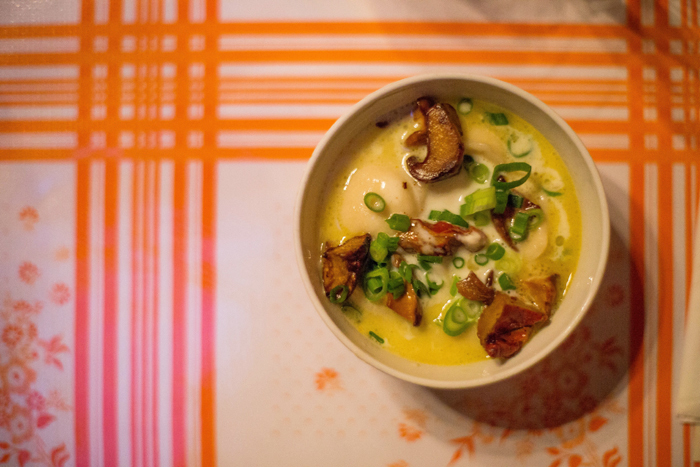 Definitely my favorite dish of the night was the Tvorog Vareniki, which are farmer’s cheese dumplings in a crayfish broth, with lobster mushrooms and scallions. Very rich and flavorful, with the mushrooms cooked perfectly! 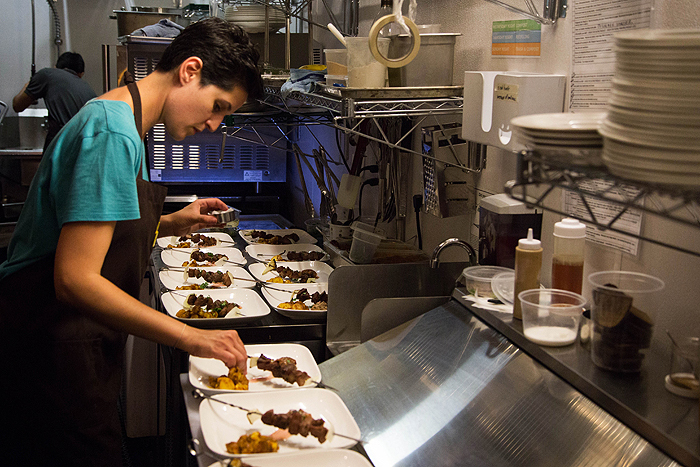 I snuck into the kitchen for a minute to watch our chefs preparing our next dish. 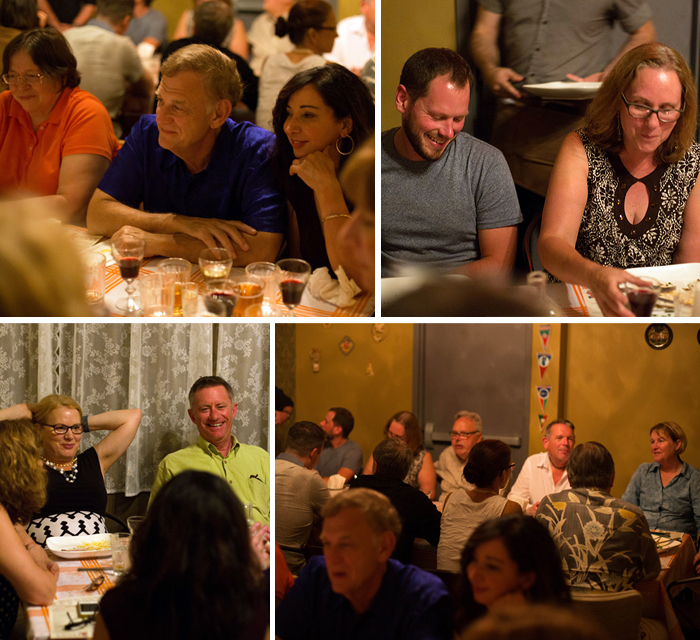 Definitely a busy place, as they were not only serving our large party but a full Saturday night dinner service. I was impressed with how often every dish was being tasted; the attention for detail is obviously of huge importance. 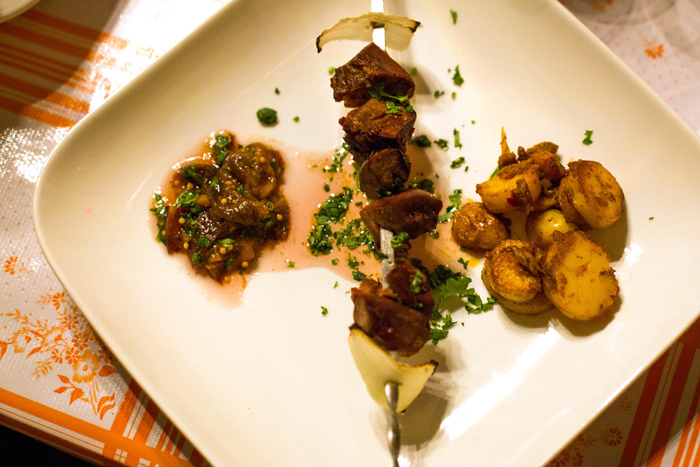 Our finished fourth course, a lamb tongues shashlik with fingerling potatoes and marinated prune plums. Now I will admit to being a little apprehensive about the lamb tongue, but I loved that it was plated in such an accessible way. It was very tender and full of flavor, paired very well with the potatoes and plums. 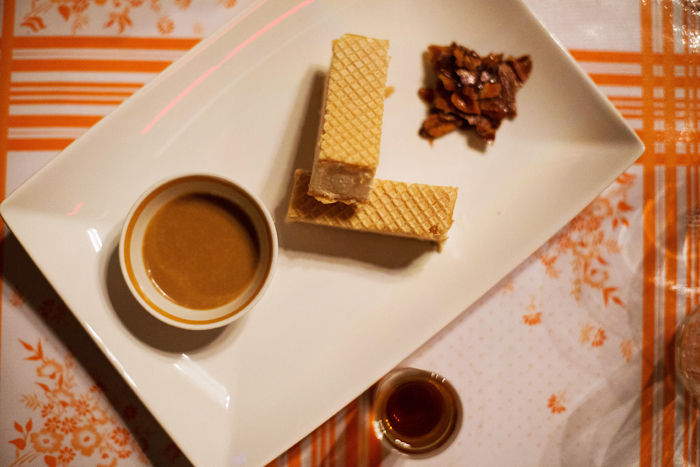 Finally we came to our dessert as the night winded down, a Russian style ice cream sandwich with almond-rose croquant and pomegranate milk caramel. WOW! So amazing. Definitely one of my favorite parts of the evening. And with a few final words (and final vodka shots) Bonnie and Israel explained some of our gift certificates for the evening which included their neighbors at Oso Market, Dove Vivi, Breakside Brewery and Frice Pastry. 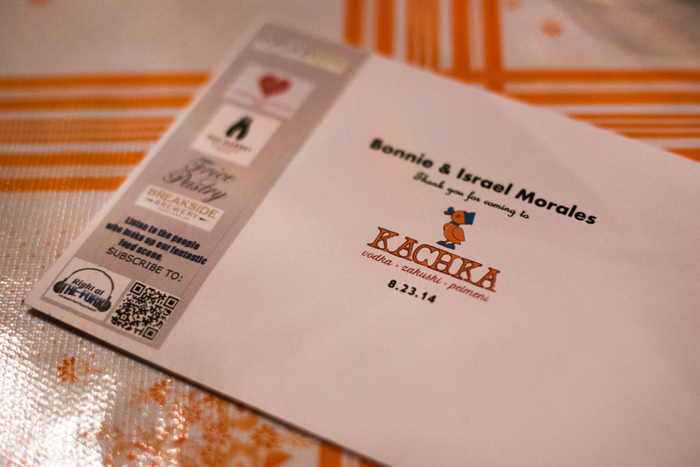 This was a wonderful night and I might mention the staff at Kachka are second to none. 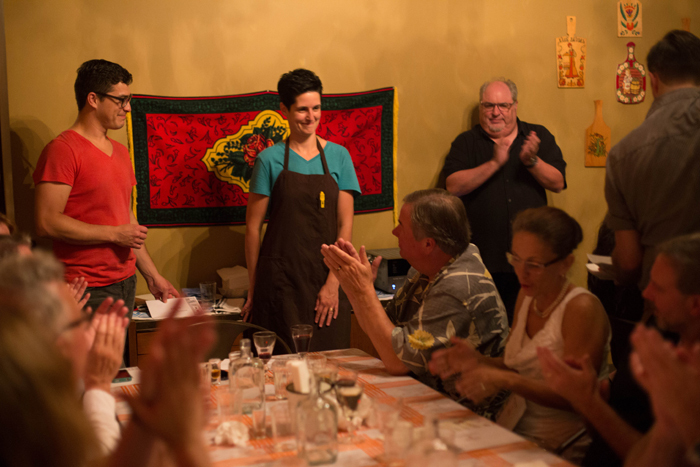 Israel was a guiding presence through the evening, and their servers were extremely attentive and polite, making everyone feel at home in their restaurant. Spasiba!